14: And in those times there shall many stand up against the king of the south: also the robbers of thy people shall exalt (Sanhedrin self exalted) themselves to establish the vision; but they shall fall. Israeli police clash with protesters during the Feb. 1 evacuation of the illegal West Bank settlement outpost of Amona. JERUSALEM, Feb. 5 (JTA) — Had Ariel Sharon been able to continue as Israeli prime minister, his main strategic goal would have been establishing a new long-term border between Israel and the West Bank. That remains the primary aim of his Kadima Party, but last week’s violent clashes between (Hassidim) settlers and police at the tiny West Bank outpost of Amona show just how difficult achieving it might be. The intensity of the confrontation highlighted a profound rift between young settler radicals and the State of Israel. Some even go so far as to say they no longer feel any allegiance to secular Israel and want to establish a theocratic “State of Judea” in its stead. The confrontation also brought to the surface differences inside the settler movement itself: The young radicals advocate uncompromising physical resistance to any further withdrawal plans; the moderates argue that the most rational thing the settlers can do is work with the government in drawing up new lines that take their interests into account. The issue surfaced again when Israel’s acting prime minister said a probe into the clashes is unnecessary. Ehud Olmert said at Sunday’s Cabinet meeting that accusations of excessive police force during the Feb. 1 evacuation of Amona should not be investigated because he doesn’t want to politicize the event. On Sunday night, settlers and their supporters showed they wouldn’t let the issue die easily either, as tens of thousands filled the streets of Jerusalem to rally against what they called an excessive use of police force in quelling the riots. The already-explosive situation is further complicated by the fact that Israel is in the throes of a general election. All the major parties are trying to exploit government-settler tensions. In the fighting over the demolition of nine illegal permanent homes built at Amona, more than 200 people were injured. The radical settlers wanted to make a point: Further evacuation of the West Bank will encounter much tougher opposition than the disengagement from the Gaza Strip and the northern West Bank in the summer did. The police wanted to establish a precedent, too: to show that nothing will deter them from carrying out government policy. Both sides are convinced they got their messages across. For the young settler radicals, the evacuation of the Gaza and northern West Bank settlements was a traumatic experience. For many it caused a major shift in their attitudes to the State of Israel. From ardent Zionists, they became bitter critics, arguing that settlement is a central Zionist tenet, a step toward the coming of the Messiah, (Moshiach ben dragon, false Christ) and, therefore, any state that gives up settlements undermines hope for redemption. For the moderates, the lesson learned from the Gaza withdrawal is very different. For them, the state remains supreme, and the challenge is to prevent a schism between the rest of the people and the settlers. Leading the moderate camp is Otniel Schneller, a former head of the Yesha council of settlers. The settlers, he argues, are servants of the majority, as reflected by the elected government. It can expand or curb settlement as it sees fit, and the settlers should go along with whatever decisions it takes. His goal is to avert future confrontation by getting the government to adopt a plan for new borders that most settlers will be able to support. To this end, he has joined Kadima, and put his plan for settlement relocation on the table. Schneller defines four types of settlement: those inside the separation fence, those close to it, those with strategic or historic value and those far from the fence with neither. The first three categories would be retained by Israel, the fourth relocated inside the fence or in Israel proper to make way for a contiguous Palestinian state alongside Israel. Schneller said he showed his plan to Sharon the day he suffered his major brain hemorrhage, and to Olmert a few days later. He claims both were impressed and that he has reason to believe the plan will be adopted as official Israeli policy. The key, though, is how much settler support he gets. Many young radicals are already branding him a traitor. But Schneller claims most settlers are behind him. “It’s hard to believe. I thought there would be an intifada against me. But it’s just the opposite. People have not stopped phoning me. They want to help, to take things forward, to see where it leads,” he told JTA. The current settler council is vacillating. Its leaders maintain close ties with radicals, while exploring compromise proposals of their own with the government. A day after doing virtually nothing to curb settler violence on Amona, council leaders Benzi Lieberman and Zeev Hever met with Foreign and Justice Minister Tzipi Livni to discuss their proposed map of settlement. The feelers came as all the main political parties are trying to use government-settler tensions in the wake of the Amona clash to score political points. The parties on the right maintain that Olmert deliberately sought the violent confrontation to create a strongman image. On the left, the claim is that under Sharon, things would have been under control, and the level of violence much lower. Olmert’s retort to critics on both sides of the political spectrum is the same: He was simply doing what had to be done — carrying out a Supreme Court order to demolish the illegal homes. The public seems confused. On the one hand, 50 percent think that Olmert wanted a bloody fight; on the other, 57 percent blame the settlers for the level of violence. More importantly, the Amona fracas seems to be having no perceptible effect on the nation’s voting patterns. In weekend polls after the violence, Kadima still had more than 40 of the 120 Knesset seats, with Labor at somewhere 16 and 21 and the Likud at between 13 and 17. The fact that such major developments as the Hamas victory in the Palestinian elections and the violent police-settler showdown have failed to dent the polls has led several Israeli pundits to conclude that election has, to all intents and purposes, already been decided. Although balloting is still eight weeks away and the campaigns have hardly started, it seems that it will take something really extraordinary to alter the anticipated outcome. Something extraordinary, like a Moshiach "REVEALED" by Sanhedrin? Jewish leaders in Ukraine blamed Ukrainian authorities, law enforcement and societal attitudes for an attempted attack on Kiev’s central synagogue. An economics magazine will be shut down after running an anti-Semitic article. The promise to shut down Global Agenda was made in a Feb. 3 letter from the head of the World Economic Forum, Professor Klaus Schwab, to the head of the American Jewish Committee, David Harris. Rabbi Mordechai Sharabi, one of the greatest Jewish mystics of the previous generation, purportedly said that [Rav Yitshak] Kaduri was the only person capable of writing amulets that have the power to bring success, heal, improve fertility or change reality for the better in some other way. In Kabbalistic thought it is believed that amulets tap the powers of demons and spirits and use them to perform miracles. In order to harness these supernatural powers, it is normally necessary to force these demons or spirits to take an oath. This is considered incredibly dangerous since the demons and spirits, once released from the oath, seek retribution. Asked once if he forces an oath on demons when he writes his amulets, Kaduri replied, "God forbid! It is forbidden to force them to take an oath. I only ask nicely. If they want to listen to me, they listen. Most of the time they respect me because I am so old." Lord God have Mercy on your saints, Who stand against these devil worshippers of Talmud Bavli and their Sorcery and Blasphemy of Talmud Bavli. Among the escapees was Jamal Ahmed Badawi, considered the mastermind of the USS Cole attack. The international crime-fighting organization said Sunday at least 13 of the 23 who escaped Friday were "convicted al Qaeda terrorists, some of whom were involved in attacks on U.S. and French ships in 2000 and 2002." "Al Qaeda terrorists have been deemed a serious threat to the entire world community by the U.N. Security Council, by Interpol and by a wide range of countries," Interpol Secretary General Ronald K. Noble said in the statement. They escaped via a 140-meter (150-yard) -long tunnel "dug by the prisoners and co-conspirators outside," Interpol said. "Their escape cannot be considered an internal problem for Yemen alone." Among the escapees was Jamal Ahmed Badawi, considered the mastermind behind the attack on the USS Cole on October 12, 2000. Badawi was sentenced to death in September 2004 for plotting the attack. Two suicide bombers blew up an explosives-laden boat next to the destroyer while the destroyer was in the Aden, Yemen, harbor for a routine fuel stop. The attack killed 17 sailors and wounded 39 others. A U.S. government official with direct knowledge of the situation told CNN that Yemeni security forces have launched a nationwide manhunt for the escaped prisoners. Elite counterterrorism units are among the troops taking part in the search, the official said. The official called the escape a "major setback" for Yemen, but says the country is sharing information about the situation with the United States. The FBI released a statement saying that information about the escape was "currently coming in through government channels." "We are closely monitoring the situation at this time and we will work with our domestic and international partners to actively pursue these dangerous terrorists through the means we have available," the statement said. NEW YORK, Feb. 3 /PRNewswire/ -- In an interview airing tonight on the PBS weekly newsmagazine NOW, Colin Powell's former Chief of Staff Lawrence Wilkerson makes the startling claim that much of Powell's landmark speech to the United Nations laying out the Bush Administration's case for the Iraq war was false. "I participated in a hoax on the American people, the international community, and the United Nations Security Council," says Wilkerson, who helped prepare the address. The NOW report, which airs days before the third anniversary of Powell's speech, examines the serious doubts that existed about the key evidence being used by the American government at the very time Powell's speech was being planned and delivered. "I recall vividly the Secretary of State walking into my office," Wilkerson tells NOW. "He said: 'I wonder what will happen if we put half a million troops on the ground in Iraq and comb the country from one end to the other and don't find a single weapon of mass destruction?'" In fact, no weapons of mass destruction were found in Iraq. 8:30 on PBS (check local listings). 1: Also I in the first year of Darius the Mede, even I, stood to confirm and to strengthen him. Thus, on October 13, 2004 the Sanhedrin seventy men EXALTED themselves, but not by the Power of God, but by the power of the Dragon, who gave them their seat and their authority, for the Father cut their authority in Ezekiel 8, even when the Father in heaven destroyed their First Temple of abomination for their Iniquity and dragon worship. Yeah they tried to take the Whore city, they attempted to disrupt the Road Map, they alone created their Chaos, they indeed attempted to slay Sharon, Judah Aholibah's secular zion government....BUT they Failed, now the Bush's bloody Talmudic RED Sofiet Hassidic Ahola the whore sister's War admenstruation will be sent in to "RESTORE" Peace in the Bloody whore city that spiritual Sodom and Egypt where our Lord was crucified, jerusalem the Whore of the earth, where the beast sits and attempts to snare all mankind to their Harlot religion unto their dragon by their anti-Christ Noahide Laws, the covenant they and all their apostate mankind have made, the Covenant with death and hell. Or will you blaspheme the God of heaven and call him satan and hide in fear in the lowestrooms of vain pride and hatred? In mid-February in Madrid, the Windsor Tower (see above) burned for over 20 hours, which led to a fire stronger and hotter than that in the WTC, but even the collapses of the Windsor Tower caused by the very strong and long-enduring fire were minimal and limited to the upper floors. If either of the WTC tower had started to collapse because of fires the collapse would have been limited to only a few of the floors and then stopped. In video tapes taken of the so-called collapses of the WTC, more explosions of these cutting charges can be seen. The explosions advance quickly, with a gap of a couple of floors, cutting the strong steel pillars in the outer wall. The explosions are timed so that it appears that the tower collapses occur in the same timing as in a gravitational collapse. The explosions are not completely synchronized in timing, probably a few charges are triggered by radio, and other charges explode out of the impulses of one of these charges (infrared, pressure wave). As seen in the following pictures, the cores of the towers were not distracted by thousands of powerful cutting charges but by a modern thermonuclear explosive, a small hydrogen bomb. In the picture below, a hydrogen bomb explosion, the bomb having been placed in the cellar and directed to the core, has reached the roof of the tower and the upper parts of the outer walls. On its way up the waves of fire pressure partially penetrated about 100 floors of concrete and steel. Over ten million degrees of heat caused by a hydrogen bomb sublimised all water within the concrete in a moment. Water exploded extremely quickly into 24-fold volume and totally pulverized the concrete. Even people and computers that were in the buildings disappeared turning into heat and light. That is why almost nothing of them was found in the ruins. Burning radiation is absorbed in steel so quickly that steel heats up immediately over its melting point 1585 °C (approx. 2890 °F) and above its boiling point around 3000 C (approx. 5430 °F). In the pictures down below, super hot groups of steel pillars and columns, torn from wall by pressure wave, are sublimized. They immediately turn into a vaporized form, binding heat as quickly as possible. Bursts upwards, even visible in the picture below, are not possible for a gravitational collapse or for cutting charges which are used horizontally. In the upper picture the explosion is in theory 100 times stronger than in the picture below, but in practice the difference is only four times due to the capability of direction of the small hydrogen bomb. Steel pillars are turned into dust. They created Haman Hamas, for their final war unto desolation, for the LORD GOD has put it in their hearts to fulfill mankind.....the Judgment is arrived, so when are you Rapture people leaving? as that the day of Christ is at hand. How they weave their Tales to bring the Bloodlust upon all apostate mankind whose father is the Murderer from the beginning, who is not the GOD of the LIVING, yet you sleep Amaraka. Burning Western Embassies, cutting off heads, flying airplanes into buildings... Tamar explains how the West is being showered with 'spit' by the East, yet proclaim "it's only raining". Plus: Eidelberg speaks on, "The myth of Israel's dependence on the United States". The Battle for the State of Israel: Is Ehud Olmert Winning? Aaron Klein, Jerusalem Bureau Chief for WorldNetDaily.com, assesses this week's violent clash in Amona and its surprising political aftermath. Klein also explains why Hamas is asking Israel for help. Beware of the Hassidic Sanhedrin deception, their ruse to take the whore city jerusalem. Acting Prime Minister Ehud Olmert said on Monday that he would be willing to hold future peace talks with the Palestinian Authority, as long as Hamas is not represented in a future government. "As long as it doesn't contain a Hamas government, we will speak and cooperate with the [PA] with caution and responsibility - with the intention of strengthening those who acknowledge the right of Israel to live without terror and within safe borders." Speaking at a European-Israeli economic forum in Tel Aviv, Olmert also said, "We will not play into the hands of extremists who want to create a nonstop war here." For these reasons, Olmert explained, he decided to transfer NIS 250 million in tax revenues to the Palestinian Authority, on condition that it "does not cooperate with Hamas." Olmert also said, "Anyone who tries to carry out terror attacks, fire Qassams, send suicide bombers - we will reach him wherever he is and strike him everywhere." Chairman of the Knesset Foreign Affairs and Defense Committee, MK Yuval Steinitz (Likud),(Sanhedrin Aholah Dan) called Olmert's speech "disgraceful." Steinitz said the speech should have been titled, "'Give Hamas a chance and give it money so that it won't find empty coffers in a month or two. Give it a unilateral withdrawal so that it will be able to establish a national army in the PA,'" as it has already done in Gaza. And all this, Steinitz said, so that Olmert will have a chance in the elections. Gideon Sa'ar (Likud) said that Olmert's excuses for transferring the money, a move the acting prime minister approved Sunday, are ridiculous. They attest to a policy of denial and place him to the left of Amir Peretz in his political-security policy, Sa'ar said. The Palestinian Authority will ask international envoy James Wolfensohn to quickly release $350 million in aid to pay salaries and keep government ministries running, a senior official said on Monday. Palestinian Economy Minister Mazen Sonnoqrot told Reuters in an interview that the money was pledged by donor countries last year and that the Palestinian Authority now needed it urgently to cover its expenses over the next two months. Palestinian Authority Chairman Mahmoud Abbas told Israel recently that he will continue to be responsible for diplomatic contacts with Jerusalem despite Hamas' victory in the PA's parliamentary elections, and requested that Israel continue this dialogue rather than ignoring him as "irrelevant." Acting Prime Minister Ehud Olmert responded that in that case, Israel will continue talking with Abbas for the time being. Abbas' message was delivered in several conversations between his emissaries and Israeli officials in recent days. In these conversations, his envoys stressed that the PLO, and not the PA, is the body that has signed all previous agreements with Israel and is officially responsible for conducting diplomatic negotiations. Since Abbas is also chairman of the PLO, he intends to continue negotiating with Israel in this capacity. On Sunday, Olmert ordered the Finance Ministry to give the Palestinian Authority NIS 249.7 million in indirect taxes (customs and value-added tax) that Israel collects on the PA's behalf. He had delayed the transfer for a few days in response to Hamas' electoral victory. However, Olmert stressed, from now on, the monthly transfers will not be made automatically; instead, the government will reexamine the situation each month and make a decision. He assigned Defense Minister Shaul Mofaz to conduct the monthly assessment on whether to transfer the tax money, but Mofaz will consult with Olmert before making a final decision. The decision to transfer the tax money was made at a special cabinet meeting on the implications of the Hamas victory. At this meeting, defense officials urged Olmert to approve the transfer, both to prevent the collapse of public services in the territories and to bolster Israel's demand that Abbas disarm Hamas. Olmert and Foreign Minister Tzipi Livni also favored the transfer; the only opposition came from Minister without Portfolio Tzachi Hanegbi. Hamas has not yet formed a government, and until it does, both Israel and the international community have decided to conduct "business as usual" vis-a-vis the PA. "We are not interested in harming the Palestinians' fabric of life," Olmert explained at the meeting. "At the moment, the sitting Palestinian government is the one that has received this money to date, and Israeli governments from all parties have transferred this money. We have means of ensuring that it goes where it should." He added that the current transfer will be fully utilized by February 15, which is when Abbas is expected to officially ask Hamas to form the next government. However, Olmert lashed out at Hamas, saying that its status has not been changed by its electoral victory. "We have no intention, in any constellation, of maintaining contacts with Hamas. Nor will members of parliament from Hamas enjoy any privileges, because someone who belongs to a terrorist organization remains as such even if he is elected to the Palestinian parliament. All Hamas members, everywhere and at every level, are members of a terrorist organization, and that is how they should be treated. Anyone involved in terror is a target, and we must act against him as we have to date. There are no limitations on the operational echelon," he said, referring to the Israeli security services. Following the meeting, Olmert met with Livni, who will leave for the U.S. on Monday. Livni will meet Tuesday with King Abdullah of Jordan, who is currently visiting Washington, and on Wednesday, she will meet with Secretary of State Condoleezza Rice and National Security Adviser Steve Hadley. The talks will focus on the implications of Hamas' electoral victory. CAIRO - Palestinian recognition of Israel was a mistake that needs correction, a senior Hamas leader said yesterday, as the organization faces international pressure to recognize the Jewish state. No ask your self why they commit suicide, self destruction? The militant Islamist group would not consider recognizing the State of Israel while the status of the country's borders remained unclear and millions of Palestinian refugees across the Arab world were not unable to return home, said Moussa Abu Marzouk, Hamas' deputy political leader. "We believe that there was a mistake that happened in the past and this (recognition of Israel) must be corrected," he said. The late Palestinian Authority chairman Yasser Arafat recognized Israel on behalf of the Palestinian people as part of the 1993 Oslo Accords. Israeli officials - and the UN Security Council - have said Hamas, which is trying to form a new Palestinian government following its recent election win, has to unequivocally recognize Israel's right to exist and abandon terrorism. The United States and European Union have said that a Hamas-led PA would risk losing crucial aid unless the organization disarmed and recognized Israel. Hamas officials have said they will not compromise their principles for funding, saying alternative monies could come from Arab and Islamic countries. Marzouk said Israel had continued building settlements and occupying Palestinian territory despite official Palestinian recognition. Israel says the status of settlements will be decided in peace talks with the Palestinians and that it undertakes military operations in Palestinian areas to protect the security of its citizens. "Where are the borders of the Israel we are supposed to recognize?" said Marzouk. "Are the settlements included in the borders? Is the return of the refugees acceptable to Israel? Until these questions are answered, it is not possible to propose it (recognition)." Hamas delegates, meanwhile, are travelling from Gaza to Cairo to meet the militant group's exiled leadership. The talks will focus on the make-up of a new government after Hamas' shock victory in last week's election. A Hamas delegation will then tour Arab capitals to seek financial support for their administration. Hamas officials and Palestinian Authority chairman Mahmoud Abbas have agreed to convene parliament on 16 February, starting the process of forming a new government. The defense establishment has identified a joint effort by Islamic Jihad and Hezbollah to initiate a new wave of terror, Shin Bet security service head Yuval Diskin told the cabinet yesterday. Diskin said Israel is at the peak of a new wave of terror. Yesterday, 58-year-old Kinneret Ben Shalom from Petah Tikva was killed and five people were injured when a knife-wielding terrorist attacked them in a taxi near Beilinson Hospital. The assailant, Ahmed Kafina, 22, from Sawiya near Nablus, was overpowered by passers-by. Diskin said that over the weekend the IDF and the Shin Bet had thwarted at least two suicide bombings planned by Islamic Jihad cells in Nablus. He also told the ministers that in the past ten days "12 potential suicide bombers" had been arrested and "a new and worrisome wave of terror" was taking place. Security sources told Haaretz that the Islamic Jihad and Hezbollah headquarters in Damascus and Beirut were streaming large sums of money into the territories to spur on terror cells to carry out attacks. The sources said they believed the most extreme Islamic groups were behind the attacks, in order to stymie efforts by Hamas, whose victory in the Palestinian parliamentary elections would make it harder for it to support further attacks, to reach an indirect agreement with Israel regarding a long-term cease-fire. Islamic Jihad, which dispatched the suicide bomber to Tel Aviv's old central bus station three weeks ago, has been more active in recent weeks in Nablus. Security forces chalk the development up to its strikes against the organization in Tul Karm and Jenin, which forced it to direct its efforts elsewhere. Military sources said they had intelligence that Islamic Jihad was planning additional suicide bombings. Over the past 24 hours, five Islamic Jihad and Fatah members have been killed in the Gaza Strip in IDF targeted operations, include two Islamic Jihad activists last night. On Saturday night three members of Fatah's military wing were killed in an Israel Air Force bombing of the organization?s offices in Gaza. One of those killed, Nasser Marshud, was described as the leader of a cell that had carried out Qassam attacks. GOC Southern Command, Major General Yoav Galant said, "If there is no quiet on the Israeli side, it will be much noisier on the Palestinian side." Peace offerings – no robbing or hating. The Passover offering, if disqualified, is to be used as a Peace offering. Now Lag BaOmer is the third day after Pesach Sheni, the second Passover. The Peace offering becomes can not be eaten on the third day and must be burnt. Rabbi Akiva’s 24,000 students died during a plague. It was Rabbi Akiva's contention that the plague was a warning to cease any further lashon hara (gossip and talebearing) or that something worse would happen. After all, anti-Shematism is necessary for the management of the Lesser jews. Right? 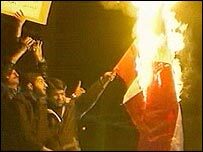 TEHRAN (Reuters) - A crowd of about 200 people pelted the Austrian Embassy in Tehran with petrol bombs and stones on Monday to protest against the publication of satirical cartoons of the Prophet Mohammad in European newspapers. The protesters, chanting "God is Greatest" and "Europe, Europe, shame on you", smashed all the diplomatic mission's windows with stones and then tried to hurl petrol bombs inside. Austria currently holds the presidency of the European Union. Protesters also waved placards and shouted slogans against the EU's stance on Iran's nuclear program. The bombs exploded in flames against metal grilles guarding the windows. But the building did not catch fire and the flames were quickly put out by police with fire extinguishers. Iran has withdrawn its ambassador to Denmark and Iranian Commerce Minister Massoud Mirkazemi said on Monday that all trade with Denmark had been severed because of the cartoons, first published in September in a Danish newspaper. "All trade ties with Denmark were cut," he was quoted by the Iranian student news agency ISNA as telling a news conference. Mirkazemi said from Tuesday Iran would stop any Danish goods from entering its customs' areas. Iran imports some $280 million worth of goods a year from Denmark. Trade ties were under review with all countries where the cartoons were published, he said. Islam prohibits any depiction of the Prophet Mohammad. Further demonstrations were planned for later on Monday outside the Danish and Norwegian embassies in Tehran. Danish diplomatic missions in Syria and Lebanon were set ablaze and ransacked over the weekend because of the cartoons. The Austrian Foreign Ministry said the Austrian cultural center building was also damaged but no injuries resulted. Denmark has called on its citizens residing in Lebanon to leave the country in light of violent anti-Denmark protests. Sunday morning, the Danish embassy in Beirut was set on fire by an angry mob. The protests, which are currently raging in Muslim communities worldwide, are a response to a Danish newspaper's publication of cartoons portraying the prophet Muhammed. Syrian forces clashed with a group of Muslim extremists, killing three of them, on the outskirts of Damascus, the official Syrian Arab News Agency reported Sunday. SANA said the group was planning attacks in Damascus and identified the militants only as "takfiris," a reference to extremists who brand as infidels other Muslims who don't adhere to their views. An angry mob of protestors set fire to the Danish embassy in Beirut Sunday. The protest was part of the international outrage among Muslims sparked by a Danish newspaper's publication of cartoons of the prophet Muhammed. Jyllands-Posten, the Danish newspaper that first published the cartoons of the prophet Muhammad that have caused a storm of protest throughout the Islamic world, refused to run drawings lampooning Jesus Christ, it has emerged today. The Danish daily turned down the cartoons of Christ three years ago, on the grounds that they could be offensive to readers and were not funny. In April 2003, Danish illustrator Christoffer Zieler submitted a series of unsolicited cartoons dealing with the resurrection of Christ to Jyllands-Posten. Zieler received an email back from the paper's Sunday editor, Jens Kaiser, which said: "I don't think Jyllands-Posten's readers will enjoy the drawings. As a matter of fact, I think that they will provoke an outcry. Therefore, I will not use them." The illustrator told the Norwegian daily Dagbladet, which saw the email: "I see the cartoons as an innocent joke, of the type that my Christian grandfather would enjoy." "I showed them to a few pastors and they thought they were funny." He said that he felt Jyllands-Posten rated the feelings of its Christian readers higher than that of its Muslim readers. But the Jyllands-Posten editor in question, Mr Kaiser, told MediaGuardian.co.uk that the case was "ridiculous to bring forward now. It has nothing to do with the Muhammad cartoons. "In the Muhammad drawings case, we asked the illustrators to do it. I did not ask for these cartoons. That's the difference," he said. "The illustrator thought his cartoons were funny. I did not think so. It would offend some readers, not much but some." The decision smacks of "double-standards", said Ahmed Akkari, spokesman for the Danish-based European Committee for Prophet Honouring, the umbrella group that represents 27 Muslim organisations that are campaigning for a full apology from Jyllands-Posten. "How can Jyllands-Posten distinguish the two cases? Surely they must understand," Mr Akkari added. Meanwhile, the editor of a Malaysian newspaper resigned over the weekend after printing one of the Muhammad cartoons that have unleashed a storm of protest across the Islamic world. Malaysia's Sunday Tribune, based in the remote state of Sarawak, on Borneo island, ran one of the Danish cartoons on Saturday. It is unclear which one of the 12 drawings was reprinted. Printed on page 12 of the paper, the cartoon illustrated an article about the lack of impact of the controversy in Malaysia, a country with a majority Muslim population. The newspaper apologised and expressed "profound regret over the unauthorised publication", in a front page statement on Sunday. "Our internal inquiry revealed that the editor on duty, who was responsible for the same publication, had done it all alone by himself without authority in compliance with the prescribed procedures as required for such news," the statement said. The editor, who has not been named, regretted his mistake, apologised and tendered his resignation, according to the statement. Yes indeed, they have their desired "Clash of Civilizations"
Muslim women chant anti-Denmark slogans at the Omer Bin Khathab Mosque in Doha. A clash of cultures has emerged after a dozen caricatures of the Prophet Mohammed were published in a Danish newspaper. Sunni Muslims burn Danish products in a bonfire Friday in Baghdad in protest of cartoons of the Prophet Mohammed first published in a Danish newspaper and then in other European publications. The caricatures have enraged Muslims because Islamic tradition bars any depiction of Mohammed to prevent idolatry. Members of Iran's Islamic militia force listen Friday to an address from former President Akbar Hashemi Rafsanjani (not pictured). Rasfanjani condemned the European press for printing caricatures of Mohammed, but he urged Muslims to respond calmly. Palestinian high school students chant anti-Danish slogans during a demonstration in the West Bank town of Ramallah. Hundreds of Palestinians marched through the streets of Gaza City on Saturday, some storming European buildings and burning German and Danish flags, to protest cartoons deemed insulting to the Prophet Mohammed. Muslim women pray outdoors Friday before demonstrating against Denmark in the Mediterranean port city of Alexandria. After a meeting with the Danish prime minister in Copenhagen, Mona Omar Attia, Egypt's ambassador to Denmark, told Reuters that "the government of Denmark has to do something to appease the Muslim world." The Danish government reportedly said it cannot interfere with freedom of the press. Palestinian supporters of the Islamic fundamentalist group Hamas demonstrate Friday in Gaza City. Some Europeans are being recalled from Gaza over concerns for their safety. Shiite men chant Islamic slogans as they set fire to an effigy of Danish Prime Minister Anders Fogh Rasmussen during a demonstration in Istanbul, Turkey, on Sunday. Some 300 ultranationalist Turks marched to the Danish Consulate in Istanbul for a separate demonstration, then lobbed eggs at the building. Thousands of outraged Syrians protesting caricatures of Islam's prophet torched the Danish Embassy in Damascus on Saturday. Also, police fired tear gas and water cannons to disperse demonstrators who crowded outside the Norwegian Embassy after earlier setting fire to the Danish Embassy, about four miles away. A Muslim cleric stands in front of the burning building housing the Danish Consulate in Beirut, Lebanon, during a Sunday protest against publication of caricatures of Islam's revered prophet in European newspapers. Security forces shot tear gas into the crowd and fired weapons in the air in a desperate attempt to stop the onslaught. At least five people have been killed in Afghanistan as protests against European cartoons mocking the Prophet Muhammad swept across the country. Two people died when protesters turned on the US airbase at Bagram - although the US has had no involvement with the images, which originated in Denmark. Meanwhile in Somalia, a teenage boy died after protesters attacked police. Iran announced it was halting trade with Denmark, as protesters pelted the Danish embassy with petrol bombs. Police fired tear gas in a bid to keep back hundreds of angry demonstrators, some of whom attempted to scale the wall into the embassy compound. Earlier, the Austrian embassy in Tehran came under attack. The violence follows attacks on Danish embassies in Syria and Lebanon over the weekend. The cartoons were first published in a Danish newspaper. There are protests again outside the European Union offices in Gaza, following demonstrations there last week. Hundreds of people took part in the morning demonstration in Afghanistan's Laghman province, in a second day of protests in the city. Demonstrators shouted "death to Denmark" and "death to France". They called for the expulsion of diplomats and soldiers, who were sent by both countries as part of international efforts in the US-led "war on terror". "They want to test our feelings," protester Mawli Abdul Qahar Abu Israra told the BBC. "They want to know whether Muslims are extremists or not. Death to them and to their newspapers," he said. In Bagram district, a peaceful protest in the morning turned violent when around 300 "bandits and gangsters" tried to enter the US base, local police chief Mawlana Sayed Khel told the BBC. A shoot-out with police left two protesters dead, and six police officers injured, he said. 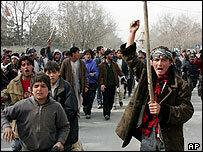 Elsewhere, hundreds protested in Kandahar, Mazar-e-Sharif and the north-eastern province of Takhar. Some 200 demonstrators gathered outside the Danish embassy in the capital, Kabul. Afghan President Hamid Karzai reiterated his condemnation of the cartoons and called on western nations to take "a strong measure" to ensure such cartoons do not appear again. "It's not good for anybody," he told CNN. In the autonomous Somali region of Puntland, demonstrators marched through the port city of Bosaso, shouting anti-Western slogans and converging on the UN and international aid agency buildings. A 14-year-old boy was reportedly trampled underfoot as police fired into the air to try and disperse an increasingly angry crowd. Peaceful protests were held in several other Somali towns. Newspapers across Europe republished the pictures last week, saying they were defending freedom of expression. In the future, the children of Yishmael will rule over the Holy land for a long time while the land is empty, just as their circumcision is empty and without completion. And they will hinder the children of Israel from returning to their place, until their merit in the Holy land runs out. In the future the children of Yishmael will stir great wars in the world. And the children of Edom [the West] will gather against them, and make war with them, one on the sea, and one on the land, and one by Jerusalem; and each one will prevail over the other but the Holy land will not fall to the hands of Edom. At the same time, a nation from the end of the world will be awakened against wicked Rome. (Rome here is said to refer to the spiritual center of western civilization) and it will make war against her for three months, and many nations will gather there, and they will fall by her hand, until all the children of Edom will gather against her from all corners of the earth. And then G-d will awaken Himself against them, as it says, "a sacrificial slaughter for the Lord in Batzra", and it says, "to shake the corners of the Land". And after this, the children of Yishmael will be finished from the world. And all the supernal powers of the nations will be broken, and no power will remain above except for the power of Israel alone. The Illuminated RED Sofiet Talmudic Blasphemous anti-Christ dragon worshippers have long planned the destruction of the USA, now it is upon you Amaraka the apostate and you sleep. Iran told the International Atomic Energy Agency to remove surveillance cameras and agency seals from sites and nuclear equipment by the end of next week, the U.N. watchdog agency said Monday. Iran's demands came two days after the IAEA reported Tehran to the Security Council over its disputed atomic program. The council has the power to impose economic and political sanctions. In a confidential report to the IAEA's 35-member board, agency head Mohamed ElBaradei said Iran also announced a sharp reduction in the number and kind of inspections IAEA experts will be allowed, effective immediately. The report was dated Monday and made available to The Associated Press. The moves were expected. Iranian officials had repeatedly warned they would stop honoring the so-called "Additional Protocol" to the Nuclear Nonproliferation Treaty _ an agreement giving IAEA inspectors greater inspecting authority _ if the IAEA board referred their country to the Security Council. A diplomat close to the Vienna-based IAEA told the AP that Iran had also made good on another threat _ formally setting a date for resuming full-scale work on its uranium enrichment program, which can make either fuel or the nuclear core of warheads. The diplomat, who spoke to the AP on condition of anonymity because the matter was confidential, refused to divulge the date set by Ali Larijani, Iran's chief nuclear negotiator, in a letter received Monday by ElBaradei. In his brief report, ElBaradei cited E. Khalilipour, vice president of the Atomic Energy Organization of Iran, as saying: "From the date of this letter, all voluntarily suspended non-legally binding measures including the provisions of the Additional Protocol and even beyond that will be suspended." Calling on the agency to sharply reduce the number of inspectors in Iran, Khalilipour added: "All the Agency's containment and surveillance measures which were in place beyond the normal Agency safeguards measures should be removed by mid-February 2006." Earlier, Russia's foreign minister warned against threatening Iran over its nuclear program after Defense Secretary Donald H. Rumsfeld reportedly agreed with a German interviewer that all options, including military response, remained on the table. Foreign Minister Sergey Lavrov called for talks to continue with Tehran, adding: "I think that at the current stage, it is important not to make guesses about what will happen and even more important not to make threats." In Norway, China's foreign minister urged continued diplomatic efforts to resolve the standoff. "A diplomatic solution serves the common interest," Li Zhaoxing said during an official visit. "We are still working on our Iranian colleagues to cherish negotiations." However, Li warned that time was "already pressing" for efforts to resolve the dispute before it reaches the Security Council. Li declined to stay whether China would support sanctions against Iran. Rabbi Yitzhak Ginsburg, head of the Kever Yossev Yeshiva (school of Talmud) in Nablus stated, "The blood of the Jewish people is loved by the Lord; it is therefore redder and their life is preferable." The killing by a Jew of a non-Jew, i.e. a Palestinian, is considered essentially a good deed, and Jews should therefore have no compunction about it. Source: Yitzhak Ginsburg, "Five General Religious Duties Which Lie Behind the Act of the Saintly, Late Rabbi Baruch Goldstein, May his Blood be Avenged"